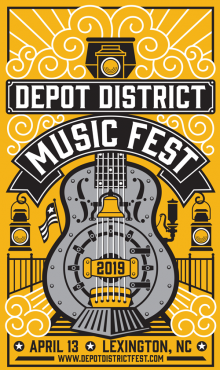 Located in the historic train depot district of Uptown Lexington, the inaugural Depot District Music Fest will celebrate community, music and the city’s full-steam-ahead progress toward the district’s revitalization. This year’s lineup includes Delbert McClinton, Turnpike Troubadours, Sister Hazel, and The Ultimate Eagles Tribute Band-On The Border. Early bird special festival tickets will go on sale Feb. 11 until midnight Feb. 18. The $30 early bird tickets for adult general admission will be available via depotdistrictfest.eventbrite.com. On Feb. 19, ticket prices will increase to $45 for adult general admission. On the day of, general admission will be $55 at the gate. Admission for children 12 and under with a paying adult, will be $10 online and $15 at the gate. VIP tickets will be available for $100. Only 125 VIP tickets will be sold that entitles holders to a dedicated front-of-stage viewing area, and access to the exclusive VIP tent which will include a cash bar and dedicated restrooms. Gates will open to the public at noon at 333 S. Main Street, with the main event entrance on East Third Avenue. The festival will feature music, beer, wine, and a variety of food truck vendors. With reentry permitted, festival-goers can enjoy dining and shopping in the Uptown Lexington Historic District. The event will end at 9 p.m. Bringing lawn chairs and blankets is encouraged. No outside food or beverages are permitted except for medical purposes; bags may be subject to inspection. Rain or shine, all ticket sales are final. Where and when does the Depot District Music Fest take place? 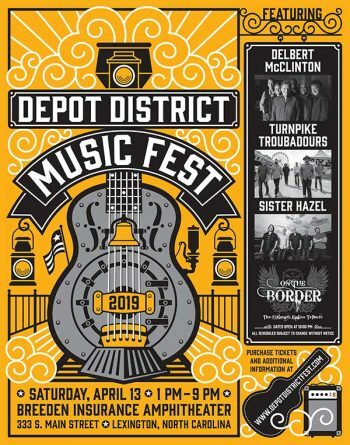 The Depot District Music Fest takes place Saturday April 13th, 2019 at the Depot District in Lexington, NC. Gates will open to the public at 12:00 Noon at 333 S. Main Street, with the main event entrance on E. 3rd Avenue. The music fest will kick off at 12:00 p.m.
Small backpacks and purses. Large backpacks, book bags, or any bag that is not clear plastic, vinyl, or PVS, and over 12”x6”x12” in size will not be allowed. Selfie sticks are allowed, but must expand to no longer than 40” in length and must be made of light material (light metal, rubber plastic). All selfie sticks are subject to Depot District Fest staff discretion and may or may not be allowed. Yes, we will allow re-entry. We want you to enjoy dining and shopping in the Uptown Lexington Historic District. We are certainly a family friendly event and welcome guests of all ages. Large backpacks, book bags, or any bag that is not clear plastic, vinyl, or PVC, and over 12”x6”x12” in size will not be allowed.